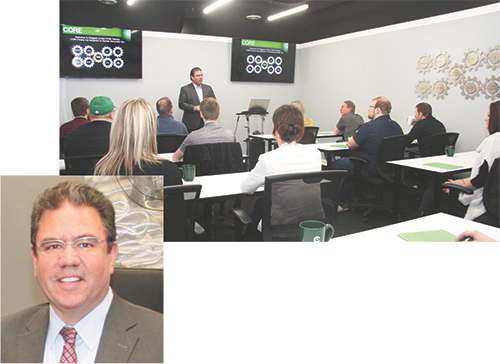 As a passionate proponent of employee education, Mike Alcala, president of Pridgeon & Clay, teaches the business section of the company’s CORE curriculum. When it comes to employee education and training, Pridgeon & Clay (P&C), Grand Rapids, MI, has continued to put its money and human-resources efforts where its heart is since receiving the Precision Metalforming Association’s Metalforming Pioneer Award in 2011 and PMA’s A.R. Hedberg Training and Education Award in 2013. The $350-million international manufacturer of stamped and fineblanked parts has doubled its annual tuition reimbursement (now at $10,500 per employee), introduced its nine-module CORE curriculum for hourly and salaried employees, and maintained its On-The-Job Training (OJT) and Automatic Press Operator (APO) programs. This commitment to employee education and training, which started back in the 1990s, by co-owners Bob and Don Clay, is an important factor in the company’s continued success, says President Mike Alcala, who reports that the company’s “annualized revenues have grown at a double-digit rate over the last few years.” Alcala joined P&C in May 2014 as COO and shortly thereafter became president. With more than two decades’ experience in executive leadership, primarily in the automotive industry, Alcala teaches the business section of the CORE curriculum, launched in June 2017. Ten years ago, Stacey Bloom started with Pridgeon & Clay as a research and development engineer. Since then, she has had progressive assignments in P&C’s various engineering and research and development functions. 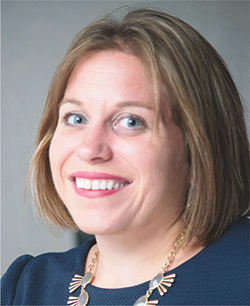 She holds a bachelor’s degree in Engineering and, with the help of P&C’s tuition-reimbursement program, earned a master’s degree in Business Administration. The CORE curriculum, one of four categories of P&C’s Training Academy, consists of nine courses, which include P&C Business Overview, Metallurgy, Energy, Presses, Dies, Welding, Quality 5S and Lean Thinking. The courses are two-day seminar-style training sessions with groups of approximately 16 that end with graduation ceremonies. The experience provides participants with a baseline knowledge of the company and an overview of the fundamentals of business and manufacturing. The Grand Rapids location, with 973 of the company’s 1469 employees, is the initial P&C location where the CORE curriculum is delivered. CORE is the most recent addition to P&C’s onsite training offerings, which also include APO and OJT. P&C employee-training programs and generous tuition reimbursement have proved a winning combination for the company and employees, resulting in improved employee retention and advancement. It has given P&C the opportunity to identify and promote leaders from within its ranks. See the Success boxes for examples. 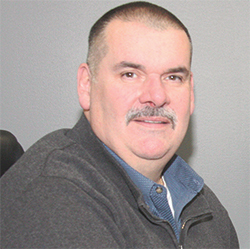 Mike Kozal, vice president of engineering, started with Pridgeon & Clay washing presses while in a high-school co-op program almost 40 years ago. He learned to be a die maker, and later earned a bachelor’s degree in Mechanical Engineering Technology from Ferris State University in Big Rapids, MI. He has held various technical positions, with one of his key contributions being his instrumental role in launching P&C’s R&D lab, in 1995. Beginning in 2011, the Precision Metalforming Educational Foundation (PMAEF), through a grant from the Hitachi Foundation, worked to identify and develop case studies about metalforming companies excelling as successful businesses through enhanced values, culture, policies, practices and investments. At these companies, success was driven by skill enhancement and advancement opportunities for production employees, creating pathways to reach higher levels of business success while also improving the skills and increasing earnings of lower-wage employees. Through those efforts, PMAEF created the Metalforming Pioneer Award to identify and recognize these excelling metalforming companies. In doing so, PMAEF provided outreach to other industry companies, allowing them to learn and apply practices to impact their bottom line while improving employee skills and lifestyles. These Pioneers were featured in MetalForming magazine and participated in events to engage other companies in the industry. See the original articles at www.metalformingmagazine.com/pioneer. “When we kicked off the program, our director of market development developed an internal marketing campaign with t-shirts, hats and banners for all of our sites, including Hungary and Mexico,” says Alcala. P&C has adapted the Bright Ideas campaign to fit the needs of its employees across the globe, with materials printed in Hungarian and Spanish, along with translators for discussion purposes when the campaign launched at those locations.